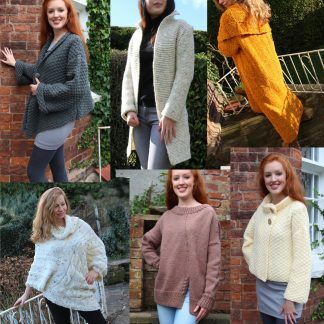 This is a designer knitwear hand knitting patterns book from Award Winning Designer Marianne Henio’s series of stylish hand knitting patterns. The asymmetrical shape is flattering and it’s a very fashionable style for all sizes. A touch of cable and a front and back split detail give an interesting addition. 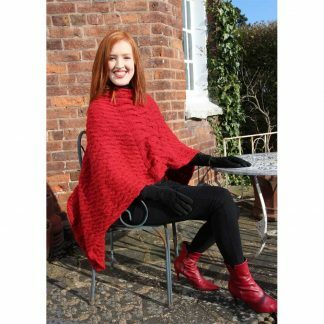 It is knitted in a chunky yarn so knits up easily and quickly. Level: Beginners to intermediate. Knowledge needed: Knit, purl, rib and cable. Decreasing and increasing. Cast on and off. Download in Digital format. 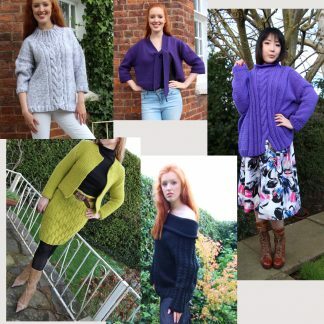 It comes from Marianne’s series of easy to knit hand knitting patterns for the beginner up, and is inspired by her catwalk designs. Plenty of full colour photographic illustrations throughout. Diagrammatical schematics, a size chart and measurement gauges are included. Marianne has recommended certain yarns but you can choose your own favourites. Included are sizes XS-SM/M-L/and XL-XXL so it should be suitable for all. A table of contents allows you to click to your required pattern size immediately for easy print off. 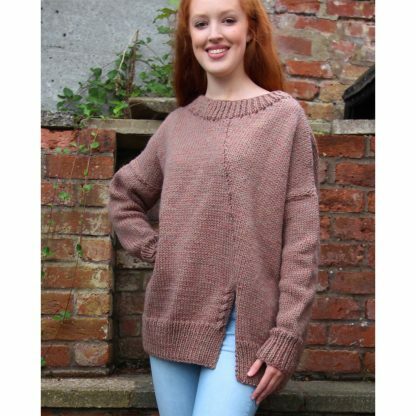 The hand knitting patterns are written in a new ‘easy to understand’ format which makes your job easy. We used Hayfields Bonus Chunky yarn in beige for the Jackie Brown Sweater. ALSO included is your FREE Guide entitled… ‘How to Design, Write & Convert your own Knitting Patterns’. Yarn used: Hayfield Bonus Chunky in Beige. Approx 670g for size M-L.